Cake pops are such a fun little bite of deliciousness. 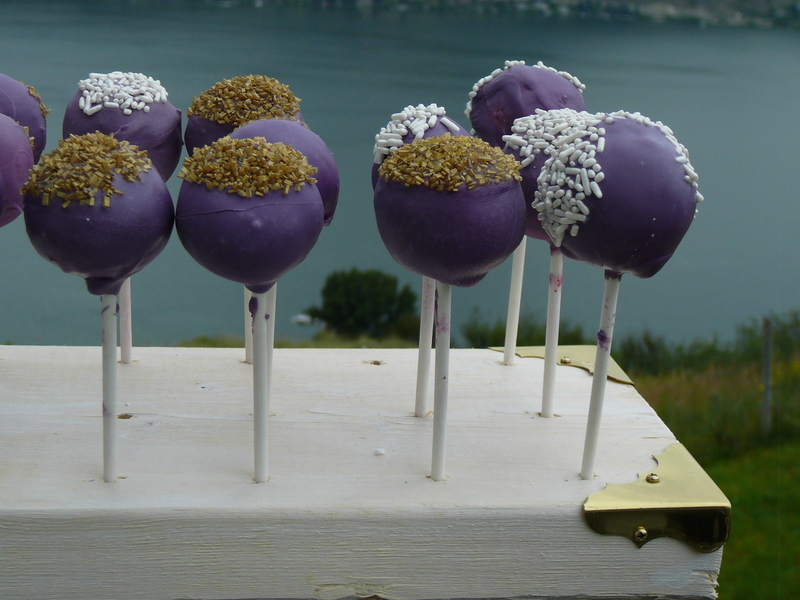 These ones were made for a stagette/shower – the brides colors are purple and yellow so of course we had to make the cake pops to match – they were fantastic. A piece of styrofoam works well to stand the cake pops in, but if you want to get creative, like my daughter Hayley, drill holes into a 2 x 6, sand it well, give it a light brushing of stain, and finish it with decorative edges! As well as the cake and icing ingredients you will need chocolate (whatever color you like – for this one we used purple chocolate wafers), lollipop sticks and whatever you would like to decorate with. Soften the butter and cream cheese – beat well. When incorporated well add the sugar and beat until it is creamy in color and fluffy. Add eggs, one at a time beating well each time, finally adding the limoncello. In a separate bowl sift flour, baking powder and salt. Add the buttermilk and the flour mixture alternately to butter. Gently fold in the lemon juice and zest until just blended. Bake at 325 in a greased, lined 8×8 cake pan for about 20-25 minutes, then cool completely. Bring butter and cream cheese to room temperature and beat well. Add limoncello and whip. Beat in icing sugar until it is as thick as you would like. When cake has completely cooled crumble it into a large bowl – make sure there aren’t any large bits. Add the buttercream icing until it can be easily rolled into a ball. (no larger than 1 inch) You may not need all the icing. 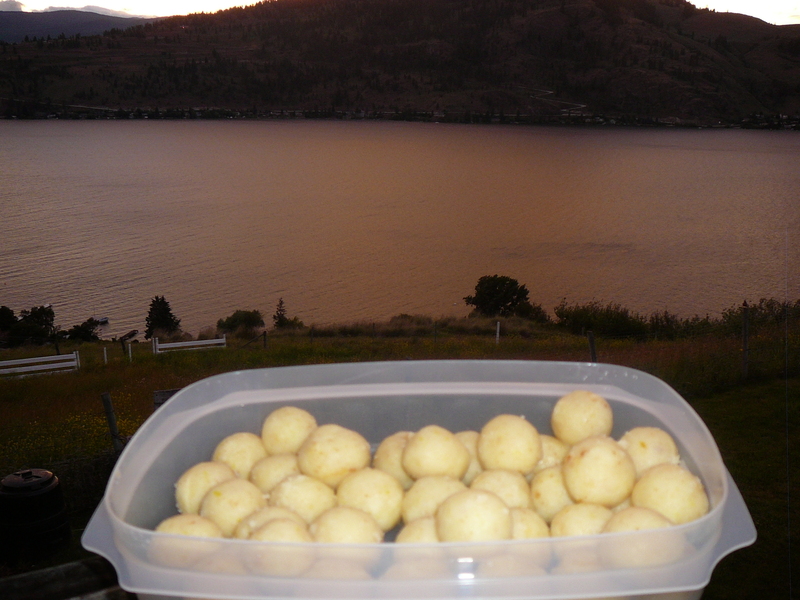 Roll all the cake/icing mixture into little 1 inch balls and set in container – freeze if you don’t have time to complete the next step. Melt chocolate over warm water just until smooth and creamy – taking care not to get any water into the chocolate. A small canning jar works really well for this – set into a pot of gently simmering water. 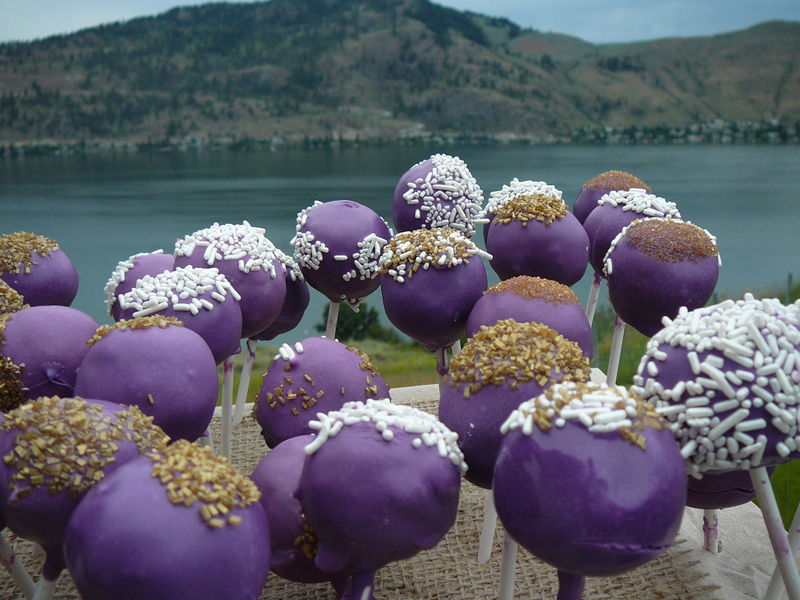 Dip the lollipop stick into the melted chocolate and press deep into the cake ball. 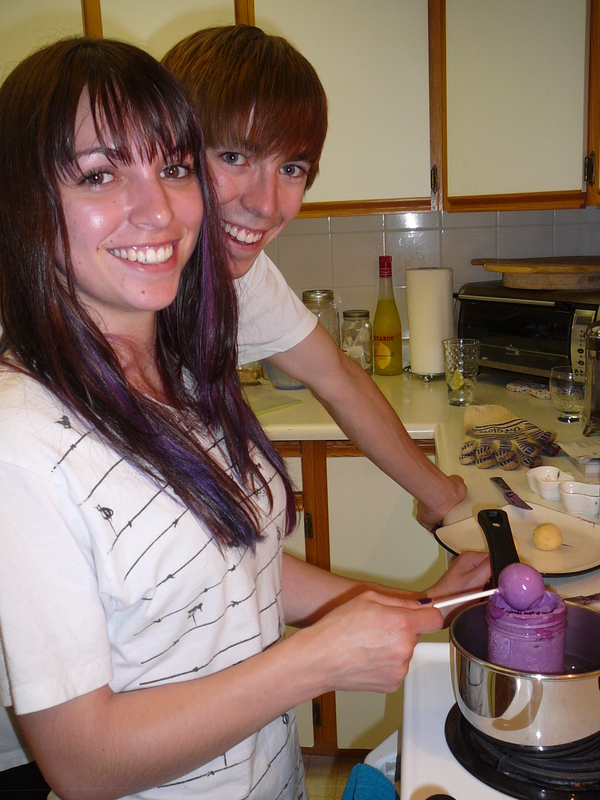 Amy and Tyler were a great help making cake pops! Allow to harden (we found it easiest to place the cake with stick into the freezer until that part was completed) Only take out what you need so it all stays cold. Then dip the cake pop into the melted chocolate until coated nicely – gently turning it and tapping on the edge of the jar the chocolate is in so the excess chocolate falls away. If you want to press any cake decorating sprinkles etc on, now is the time. A large piece of styrofoam is perfect to set the lollipop sticks in so that the chocolate hardens without touching anything. Once hardened they are pretty sturdy, and you can further decorate or just put on display. This entry was posted in Baking, Dessert, Recipes and tagged cake, cake pops, dessert, limoncello, shower by Chatty Kathy. Bookmark the permalink. These are adorable! I love the colors! They were such fun to make and everybody loved the colors too!